Hello everyone, Pizza Dave here, delivering a kit review. Today I will be going over the Wismec Active Kit. This device was sent to me by Heaven Gifts for review. The Active is the latest device to hit the market from Wismec, and is designed to be the dream mod for someone who leads an active lifestyle. Water resistant, rugged, and..a Bluetooth speaker? Yep, you heard that right. The active unleashes the largest gimmick in a mod yet, so let’s dive down, look at how it all works, and see if this leap pays off for Wismec. Available in Orange, Black, and Silver. There are also several different silicone sleeves coming out on the market. One of the first things you will notice is that with the tank removed, it looks more like a Bluetooth speaker than a vaping device. It has all the characteristics one would expect from something advertised as a go anywhere device. The rubber jacket, the carabiner clip, the lightweight frame. All of it comes together to make an appealing mod for someone who indeed lives an active lifestyle of camping, hiking, fishing, etc. Even though this mod is packed into a plastic frame it feels solid and sturdy for the most part. I don’t know how well it will handle drops, or banging off objects, but it has a feel that it could hold up to a beating. 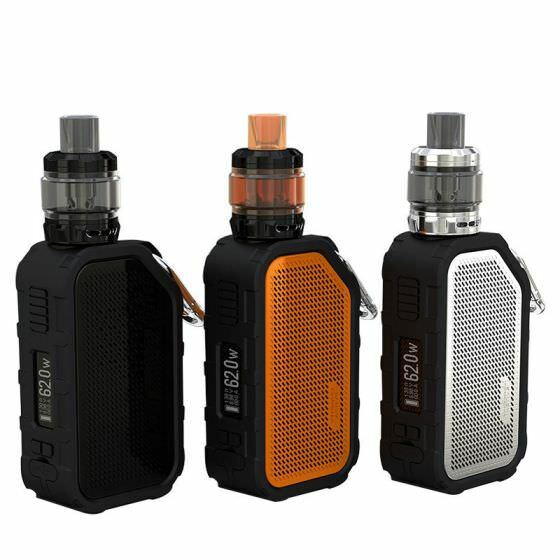 Once we dig deeper, beyond that rugged style, you’ll find an 80w mod, powered by an internal 2100mah battery, and a decent sub-ohm tank, and the last feature that I never thought I would see in a mod, Bluetooth? 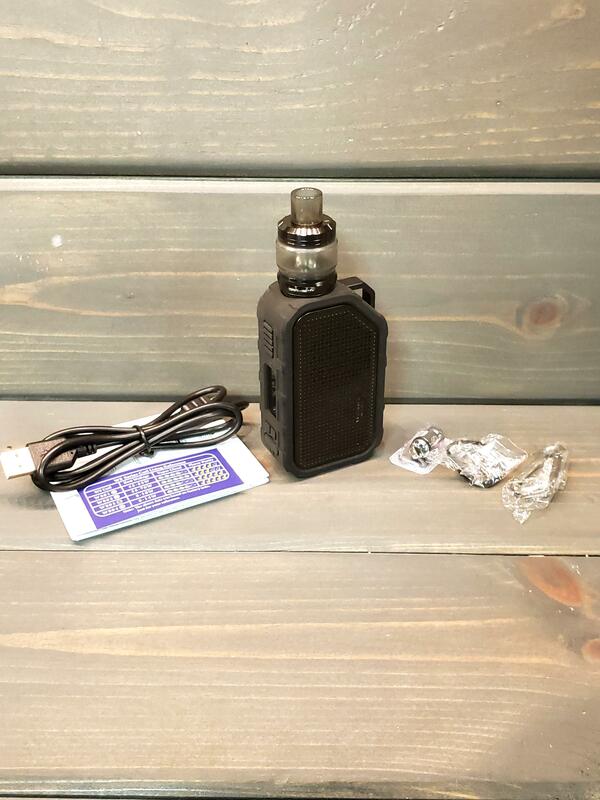 Overall, this is a basic 80w mod that comes with all of the typical function of today’s vaping devices. 5 clicks on, 5 clicks off, and 3 clicks of the fire button allows you to scroll through a basic menu. 4 clicks of the fire button in a temp control mode will enter the wattage setpoint that it starts up at. To switch from Celsius to Fahrenheit, scroll through the temperature and it will jump over to one of the other. The last button combo is locking. Press the up and down buttons together and it will lock those buttons. The mod will still fire with the lock on. So that is it. It is a basic mod that is easy to figure out by just clicking around and doesn’t require a manual for anyone who has used a modern regulated mod. As for the Bluetooth speaker, it is also easy to figure out as it has separate buttons opposite of the screen to control that. Hold down power, (it will tell you when Bluetooth mode is on), then go to whatever device you are connecting to this, look for it on your device, link the Bluetooth, and start playing some music, listening to a book, or whatever you wanna listen to on it. Everything is simple and easy to figure out just by clicking around on it. For the most part, I used this device with the included tank and wattage mode. In short, it can provide a decent vape with either coil that you choose. In temperature control, it basically ramps up, hits the temp setting, tapers WAY down, and pops up as “temperature protection” on the screen. Once it cools down slightly, it ramps back up again. It isn’t very smooth in TC at all as it basically fires, doesn’t fire, fires again. I never got burnt hits, but it is not smooth in any way. I found that it had enough battery life to get me through the day running at 50w, and not running it as a speaker at all during that time but that is not the case if you plan to listen to music and vape at the same time. Once you do that, battery life drops dramatically. You will be lucky to get maybe an hour and a half of enjoyment before recharging. The speaker itself actually sounds decent, and it puts out a good amount of volume. To me, the added speaker was more like a party trick than a functional aspect. The first day I had it, we were all grilling out. Someone wanted some tunes, so I took that as my cue. I linked my phone, cranked up some Pandora, and had a few vapes while it was maxxed out on volume. It got a lot of laughs and also garnered a lot of interest from other vapors. I could see the appeal for this in situations that might arise every so often, but like I said above, the excitement is short lived as the battery is dead before you know it. As I always do in my how it vapes sections, I will cover the included tank next. 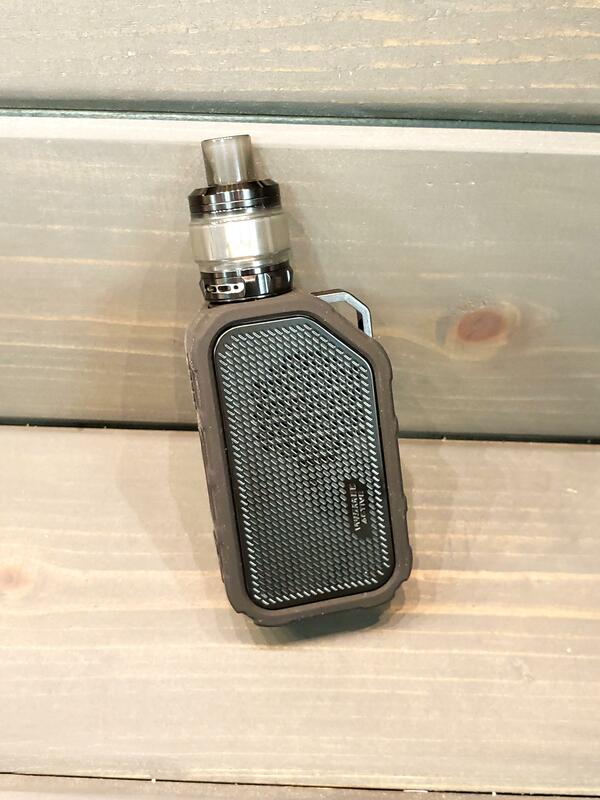 The Armor NC is a solid pairing for this device as it isn’t a power-hungry tank, which is great considering many might want to vape and listen to music at the same time. It offers up both MTL and direct lung inhales, both of which function well. For an MTL vape, install the 1.3-ohm head, close down the air flow, and operate around 15w or so. For a much more open, direct lung inhale, toss in the .2-ohm coil, open it up, and vape it at 50w. The vape from both coils is actually pretty decent, and coil life isn’t terrible either. The MTL coil runs best with thinner e-liquid, as the wicking slots are not very large. The DL coil works fine with higher vg liquids and doesn’t have issues keeping up at all. Both of them sip e-liquid, which is a huge pro for something that is designed to take anywhere. Overall, this tank is a perfect match to this mod. The low battery consumption, and the low juice consumption make it great for a device that is designed for those on the go. 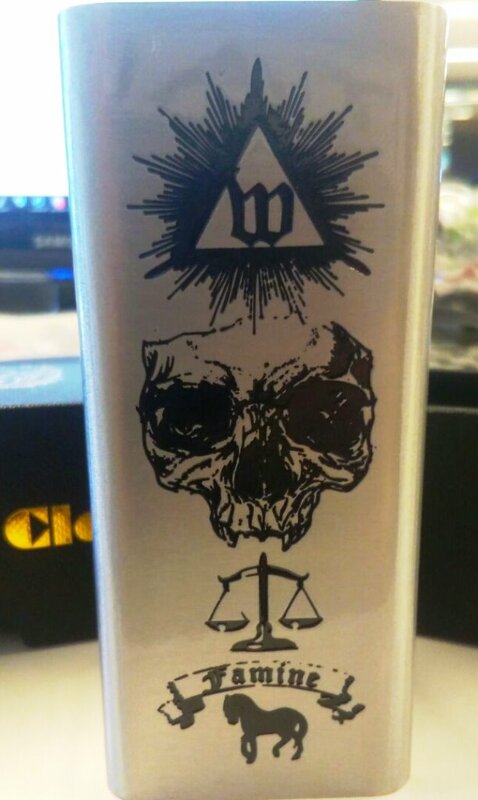 The fact that it caters both to MTL and DL vapors is excellent and well executed. This tank is not something that is going to blow you away, but it pairs up well with this mod. I only found a couple of cons that jumped out at me. The largest of which is a durability concern. The tank cranked after my mod tipped over ONE TIME! For something named Armor on a “rugged” device, one would think it would hold up but that is not the case here. The last con is how well it fits on this mod. It overhangs the top edge and looks a bit out of place, but that is going to be the case with several atomizers on this device due to the shape of the top. Glass broke when mod tipped over. The market for this is a tough one to place. Every bit of advertising pushes this one towards people that hike, fish, camp, etc but it doesn’t fully live up to these standards. It isn’t fully water proof but can handle some splashes if they happen. It doesn’t appear to have the durability to withstand severe abuse either, so I wouldn’t feel confident banging this one off rocks and what not while hiking either. Yes, it is light weight and portable, but I wouldn’t leave it dangling from a carabiner if you want it to last. The main gimmick that this is known for is having the ability to play music. Overall, as a speaker it works. The sound is much better than listening to a phone speaker, and it can offer a few hours of music if it isn’t cranked. Like I said above, vaping this, and listening to it kills the battery quickly, so it just isn’t practical. Another con is when you do have music cranked and you vape on it, it’s blasting right in your face and vibrates on your lips. I also experienced some firing issues with it. What I found was it didn’t always fire right away, and I would have to release and hit the fire button again to get it to go. I struggled to WANT to use this thing for review, and it just isn’t for me. It is fun to show off, but beyond that it just isn’t practical for real world use. Water resistant only, so it can take some splashes, but don’t dunk in water! Thank you everyone and thank you to Heaven Gifts for sending it my way for review. If you want to rock out with your mod out, you can find it for about $70-80.